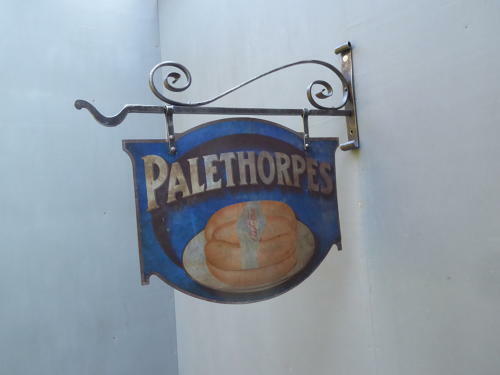 A wonderful antique advertising sign for Palethorpes Sausages. An extremely rare surviving example of this double sided tin pictorial enamel advertising sign, suspended from a wrought iron wall bracket & featuring some fantastic colours & typography. The sign would have been displayed outside a butchers or grocers & makes a fantastic decorative piece for the kitchen, cafe or restaurant. Wear commensurate with age, displays beautifully with one side better than the other as is usually the case. The bracket is original to the sign though has been historically stripped & the adjoining bolts & at leasst one of the small brackets are later replacements. The dimensions above are overall dimensions of the sign & bracket together, the sign alone measures 50cm x 38cm.